they pass overhead, a stave of wires their nest? themselves apart like aging stars or clocks? Two years ago this month, I read a slender book called The Absent Therapist, by British novelist and poet, Will Eaves. It would become one of my top books of 2014 and remains, to this day, one of my bedside essential texts. 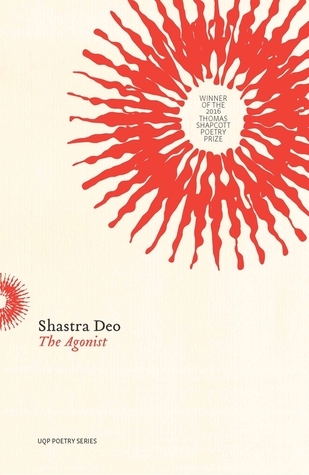 This fragmentary tour through the musings and minds of a host of disembodied characters comes together to create a thoughtful, intelligent, and affecting piece of experimental fiction. It’s a book I’ve returned to often. The Inevitable Gift Shop, released earlier this year, forms a counterpoint to The Absent Therapist, but whereas Therapist was a project of inhabitation, brief and fleeting, interjected with moments of factual or speculative distancing—the mood of Gift Shop is much more immediate, personal. The text is divided into sections of poetry and prose, with the latter, still fragmentary, moving between memoir, literary criticism, natural science, and even the occasional humorous aphorism. The result is an unclassifiable work that is welcoming, engaging, unpretentious, and wise. Even writing this is a perilous sort of confession: I will read it over and hear a small voice piping away, an echo that is shaming, and peculiar, because its mental acoustic is also so much to be desired. Because my refuge from all kinds of strange accusation and self-doubt will be the place anterior to the page – inside of my head. By laying himself open in the earliest pages, Eaves is setting a tone that runs through this work and pulls it together into a cohesive whole. There is something in his voice—a measure of quiet reflection, as if he is thinking aloud and inviting the reader to listen and take from it what he or she wishes without expectation—that is refreshing. In this era of the self-indulgent introspective memoir and its thinly-veiled fictional counterpart, Eaves is, by contrast, slightly self-conscious in his writing. As a result, the memories and reflections he shares take on a special intimacy and personal feel throughout this work, whether he is remembering his mother, commenting on Madame Bovary, analyzing Shakespeare’s Sonnets, musing about the nature of consciousness, or detailing the unfortunate mating habits of captive tortoises. Something is more or less well done but it flows away from me in the doing, and when it’s finished I feel often a mild perplexity at the thing done – at the idea that it had anything to do with me in the first place. Because there is no way back into the work as it happens. Much as we rejoice in the escape from personality, we’re apt to be disconcerted by the experience of liberation – by the irretrievable oddity of what we produce. How was this written, who wrote it? Poetry, is the discipline exerted on or by words in order to summon feeling, often very painful feeling, at will. It is powerful because it recognizes that the material world, as far as humans are concerned, exits in psychological flux: no material or brute fact is an island. It survives in an atmosphere of witness…. The messiness of the world as it presents itself to creatures of emotion becomes subject to ordering, but the aim of poetic ordering is not to deny the emotion or regulate the world: it is to stabilize both in a form of words – an incantation, Thom Gunn says – that faces the entirety of the mystery, of why we are here to see and hear and locate these things in every daily particular. The Inevitable Gift Shop, as its title (taken from the comment of the tour guide at an Icelandic greenhouse called The Garden of Eden) implies, is a collection of oddities, amusements and small treasures that reveal a deceptive depth as one browses its offerings. As a reader and writer, I suspect this is another book that I will return to time and again, fitting well alongside not only The Absent Therapist, but one of my favourite similarly eclectic collections of writerly wisdom and poetry, Breyten Breytenbach’s Intimate Stranger. 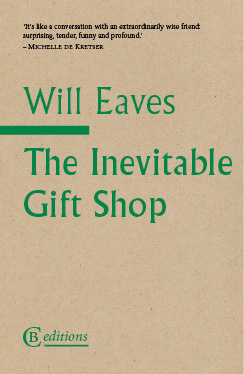 Original, undefinable and yet well worth the visit, The Inevitable Gift Shop by Will Eaves is available from CB Editions. It is the Thanksgiving weekend in Canada. We planned to gather, as a family, at my parents’ house to begin the process of determining what will be kept, sold, and thrown out; and to assess the repairs required before the house can be put on the market next year. However, an early taste of winter has caused us to cancel our plans due to road conditions (they lived two hours northwest of the city where my brothers and I all live). With a mixture of relief and an unresolved need to begin the process of closure, I am re-posting an updated version of what was, at the time of its original writing, a premature tribute to my father. The sentiment, now relevant, remains. His library is one of my major concerns. Originally published in December, 2015, I have updated this essay with an addendum. I have not written much recently on my own ongoing struggles following a serious breakdown last year – a set back to the level of mental health I imagined I had sustained for more than a decade. I don’t think I have even begun to grieve or articulate that yet. The quote that begins this blog from my friend Blahpolar is part of an ongoing dialogue her posts have inspired me to engage in. As such it is worth reblogging here. He’s right, of course; all endings merit some form of grief, no matter how unobtrusive. And grief comes with varying levels of heartbreak. I will be reading along with 10 other fine book bloggers will keep me busy for the next few weeks as we have our go at the IFFP 2015 long list. I have 12 of 15 books to read. Yikes!!! !